The Ven. Ledi Sayadaw was born in 1846 in Saing-pyin village, Dipeyin township in the Shwebo district (currently Monywa district) of northern Burma (nowadays called Myanmar.) His childhood name was Maung Tet Khaung. (Maung is the Burmese title for boys and young men equivalent to "master." Tet means "climbing upward" and Khaung indicates "roof" or "summit.") It proved to be an appropriate name since young Maung Tet Khaung indeed climbed to the summit in all his endeavours. In his village he attended the traditional monastery school where the bhikkhus (monks) taught the children to read and write in Burmese as well as how to recite many Pali texts: the Mangala Sutta, mettā Sutta, Jataka stories, and so on. Because of these ubiquitous monastery schools Myanmar has traditionally had a very high literacy rate. At the age of eight, he began to study with his first teacher U Nanda-dhaja Sayadaw, and he ordained as a samanera (novice) under the same Sayadaw at the age of fifteen. He took the name Nana-dhaja (the banner of knowledge). His monastic education included Pali grammar and various texts from the Pali canon with a specialty in Abhidhammattha-sangaha, a commentary which serves as a guide to the Abhidhamma2 section of the canon. Later in his life he wrote a somewhat controversial commentary on Abhidhammattha-sangaha, called Paramattha-dipani (Manual of Ultimate Truth), in which he corrected certain mistakes he had found in the earlier (and then accepted) commentary on that work. His corrections were eventually accepted by the bhikkhus and his work became the standard reference. During his days as a samanera, in the middle part of the nineteenth century (before modern lighting) he would routinely study the written texts during the day and join the bhikkhus and other samaneras in recitation from memory after dark. Working in this way he mastered the Abhidhamma texts. When he was eighteen, Samanera Nana-dhaja briefly left the robes and returned to his life as a layman. He had become dissatisfied with his education, feeling it was too narrrowly restricted to the Tipitaka3. After about six months his first teacher and another influential teacher, Myinhtin Sayadaw, sent for him and tried to persuade him to return to the monastic life; but he refused. Myinhtin Sayadaw suggested that he should at least continue with his education. The young Maung Tet Khaung was very bright and eager to learn, so he readily agreed to this suggestion. "Would you be interested in learning the Vedas (ancient sacred writings of Hinduism)?" asked Myinhtin Sayadaw. "Yes, venerable sir," answered Maung Tet Khaung. "Well, then, you must become a samanera," the Sayadaw replied. "Otherwise Sayadaw U Gandhama, of Yeu village, will not take you as his student." "I will become a samanera," he agreed. In this way, he returned to the life of a samanera, never to leave the robes of a monk again. Later on, he confided to one of his disciples, "At first I was hoping to earn a living with the knowledge of the Vedas by telling peoples' fortunes. But I was more fortunate in that I became a samanera again. My teachers were very wise; with their boundless love and compassion, they saved me." The brilliant Samanera Nana-dhaja, under the care of Gandhama Sayadaw, mastered the Vedas in eight months and continued his study of the Tipitaka. 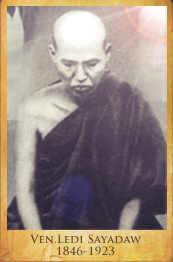 At the age of twenty, on 20 April 1866, he took the higher ordination to become a bhikkhu under his old teacher U Nanda-dhaja Sayadaw, who became his preceptor (one who gives the precepts). In 1867, just prior to the monsoon retreat, Bhikkhu Nana-dhaja left his preceptor and the Monywa district where he had grown up, in order to continue his studies in Mandalay. Mandalay was the royal capital of Burma at that time, during the rule of King Min Don Min (who ruled 1853-1878), and was the most important centre of learning in the country. He studied there under several of the leading Sayadaws and learned lay scholars as well. He resided primarily in the Maha-Jotikarama monastery and studied with Ven. San-Kyaung Sayadaw, a teacher who is famous in Myanmar for translating the Visuddhimagga (Path of Purification) into Burmese. During his time in Mandalay, King Min Don Min sponsored the fifth council, calling bhikkhus from far and wide to recite and purify the Tipitaka. It was held in Mandalay in 1871 and the authenticated texts were carved into 729 marble slabs that stand today (each slab housed under a small pagoda) surrounding the larger golden Kuthodaw Pagoda at the foot of Mandalay hill. At this council, Bhikkhu Nana-dhaja helped in the editing and translating of the Abhidhamma texts. During the time of his studies in Mandalay, Ven. San-Kyaung Sayadaw gave an examination of twenty questions for two thousand students. Bhikkhu Nana-dhaja was the only one who was able to answer all the questions satisfactorily. These answers were later published in 1880, under the title Parami-Dipani (Manual of Perfections). This was the first of many books to be published in Pali and Burmese by Ven. Ledi Sayadaw. After eight years as a bhikkhu, having passed all his examinations, Ven. Nana-dhaja was qualified as a beginning Pali teacher at the San-Kyaung monastery (also known as the Maha-Jotikarama monastery) where he had been studying. For eight more years he remained there, teaching and continuing his own scholastic endeavours, until 1882 when he moved to Monywa. He was now thirty-six years old. At that time Monywa was a small district centre on the east bank of the Chindwin River, which was renowned as a place where the teaching method included the entire Tipitaka, rather than just selected portions. While he was teaching Pali to the bhikkhus and samaneras at Monywa, his habit was to come to town during the day for his teaching duties. In the evening he would cross to the west bank of the Chindwin river and spend the nights in meditation in a small vihara (monastery) on the side of Lak-pan-taung mountain. Although we do not have any definitive information, it seems likely that this was the period when he began practicing Vipassana in the traditional Burmese fashion: with Anapana (respiration) and vedana (sensation). The British conquered upper Burma in 1885 and sent the last king, Thibaw (who ruled from 1878-1885), into exile. The next year, 1886, Ven. Nana-dhaja went into retreat in Ledi forest, just to the north of Monywa. After a while many bhikkhus started coming to him there, requesting him to teach them. A monastery to house them was built and named Ledi-tawya monastery. From this monastery he took the name by which he is best known: Ledi Sayadaw. It is said that one of the main reasons that Monywa grew to be a larger town, as it is today, was because so many people were attracted there to Ledi Sayadaw's monastery. While he taught many aspiring students at Ledi-tawya, he retained his practice of retiring to his small cottage vihara across the river for his own meditation. When he had been in the Ledi forest monastery for over ten years his main scholastic works began to be published. The first was Paramattha-Dipani (Manual of Ultimate Truth), mentioned above, published in 1897. His second book of this period was Nirutta Dipani, a book on Pali grammar. Because of these books he gained the reputation as one of the most learned bhikkhus in Burma. Though Ledi Sayadaw was based at the Ledi-tawya monastery, he travelled throughout Burma at times, teaching both meditation and scriptural courses. He is indeed a rare example of a bhikkhu who was able to excel in both pariyatti (the theory of Dhamma) as well as patipatti (the practice of Dhamma) in his life. It was during these trips up and down Burma that many of his published works were written. For example, he wrote the Paticca-samuppada Dipani in two days while travelling by boat from Mandalay to Prome. He had no reference books with him, but he had a thorough knowledge of the Tipitaka, so he needed none. In the Manuals of Buddhism there are seventy-six manuals (dipanis), commentaries, essays, and so on, listed under his authorship, but this is not a complete list of his works. Later he also wrote many books on Dhamma in Burmese. He said he wanted to write in such a way that even a simple farmer could understand. Before his time, it was not usual to write on Dhamma subjects so that lay people could have access to them. Even while teaching orally, the bhikkhus would commonly recite long passages in Pali and then translate the passage literally, which was very hard for the ordinary person to understand. It must have been that the strength of Ledi Sayadaw's practical understanding and the resultant mettā (loving-kindness), overflowed in his desire to spread Dhamma to all levels of society. His Paramattha-sankhepa, a book of 2,000 Burmese verses which translates the Abhidhammattha-sangaha, was written for young people to learn and is still very popular today. His followers started many associations which promoted the learning of Abhidhamma by using this book. In his travels around Burma Ledi Sayadaw also discouraged the use of cow meat. He wrote one book called Go-mamsa-matika which urged people not to kill cows for food and promoted a vegetarian diet in general. It was during this period, just after the turn of the century, that the Ven. Ledi Sayadaw was first visited by U Po Thet who learned Vipassana from him and subsequently became one of the most well-known lay meditation teachers in Burma, and the teacher of Sayagyi U Ba Khin, Goenkaji's teacher. By 1911 his reputation both as a scholar and meditation master had grown to such an extent that the British government of India, which also ruled Burma, conferred on him the title of Aggamaha-pandita (foremost great scholar). He was also awarded a Doctorate of Literature from the University of Rangoon. During the years 1913-1917 he had a correspondence with Mrs. Rhys-Davids of the Pali Text Society in London and translations of several of his discussions on points of Abhidhamma were published in the "Journal of the Pali Text Society." In the last years of his life Ven. Ledi Sayadaw's eyesight failed him because of the years he had spent reading, studying and writing, often with poor illumination. At the age of seventy-three he went blind and devoted the remaining years of his life exclusively to meditation and teaching meditation. He died in 1923 at the age of seventy-seven at Pyinmana, between Mandalay and Rangoon (now Yangon), in one of many monasteries that had been founded in his name as a result of his travels and teaching all over Burma. The Venerable Ledi Sayadaw was perhaps the outstanding Buddhist figure of his age. All who have come into contact with the path of Dhamma in recent years owe a great debt of gratitude to this scholarly, saintly monk who was instrumental in re-enlivening the traditional practice of Vipassana, making it more available for renunciates and lay people alike. In addition to this most important aspect of his teaching his concise, clear and extensive scholarly work served to clarify the experiential aspect of Dhamma. The title Sayadaw means "venerable teacher." It was originally given to important elder monks (Theras) who instructed the king in Dhamma. Later on it became the title of highly respected monks in general. Abhidhamma is the third section of the Pali canon in which the Buddha gave detailed technical descriptions of the reality of mind and matter in a very profound form. Tipitaka is the Pali name for the entire canon. It means "three baskets," i.e., the "basket"of the Vinaya (rules of the monks); the "basket" of the Suttas (or discourses); and the "basket" of Abhidhamma (see note 2, above). Venerable Ledi Sayadaw is an invaluable link in the chain of teachers that preserved Vipassana in its pristine purity in Myamnar. Hence it is natural that Vipassana students should be eager to read the books written by the Venerable Sayadaw, probably the most illustrious Abhidhamma scholar of the last two centuries. However, the writings of this great meditation master are not easily available today. Therefore, Vipassana Research Institute has published The Manuals of Dhamma, a collection of the Venerable Ledi Sayadaw’s writings translated into English. The reader will find a great treasure of information as well as inspiring guidance for the practice of Dhamma in these texts. The Manuals of Dhamma will be of immense benefit to students of Vipassana as well as to research scholars.